Building a new pool may seem to be a large project. Trust in us to build your new pool with great detail and efficiency. Build your new pool with the vision you have always dreamed of. Blue Wave will make it enjoyable with a fantastic outcome. 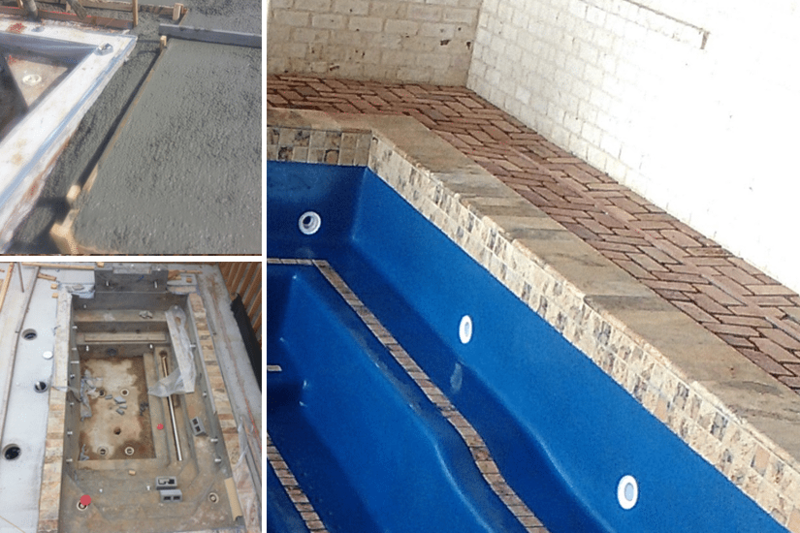 View our gallery of the pool construction process to see the steps that will be taken thancontact us to build your new pool. At Blue Wave Pools we make the entire pool project easy, seamless and enjoyable for all. Our entire team is not only highly experienced but extremely courteous and friendly as well. We stand by your side every step of the way while we design and complete a beautiful poolscape for you to enjoy for many years to come. The first step is designing the layout in a 3D rendering. Excavation of the land begins using a track hoe or bobcat. The pool hole is over dug to allow for the pool shell. The pool can now be formed using wood. 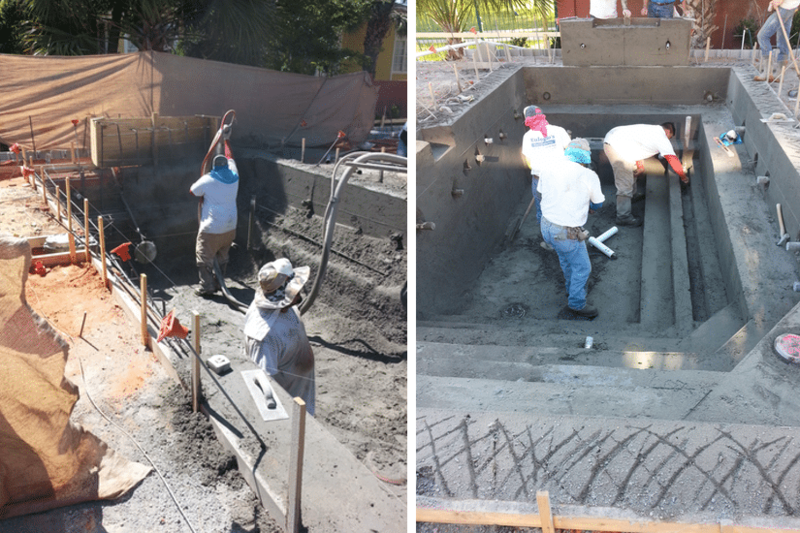 Next, a steel rebar grid is installed to give your pool superior strength and to reinforce the gunite. Pool tile and coping can now be installed. It is extremely important to hire an expert craftsman in this field. While this work is being completed the filter system can be installed. When the coping around the pool is complete the decking can be installed. The final finish to the pool project is the plaster. It is hand troweled to a slip resistant surface. 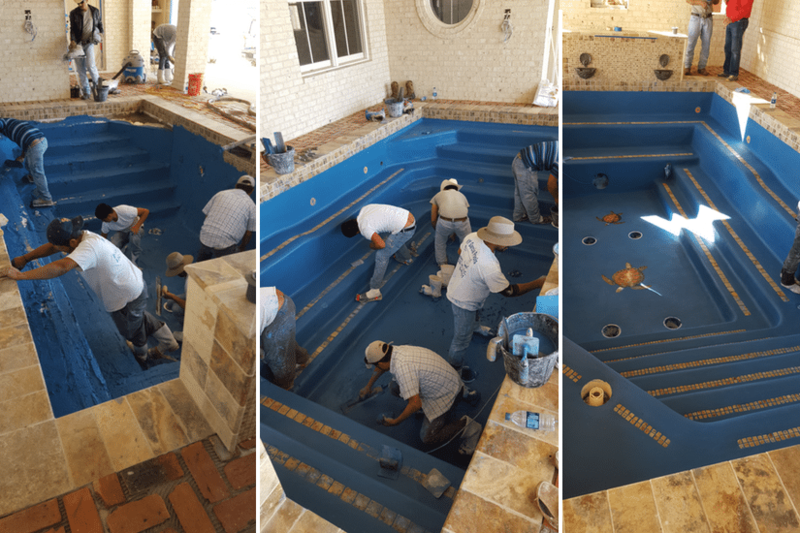 When your project is complete you will be amazed at the outcome and so very happy you chose Blue Wave Pools to make your backyard vision a reality. Do not wait, contact Blue Wave today for your free no obligation quote. Are you experiencing too many lazy, hot summer days when you long for the cool, crystal clear waters of your very own swimming pool? No need to pack up the sunscreen, towels and pool toys and get into a hot sweltering car to drive to the town pool. It’ is time to open your own back door and step out into your very own simply stunning oasis. Contact Blue Wave Pools today to learn more about all of the services we provide so you can finally have the backyard you have always dreamed of. Start enjoying life, lessen your stress, relax alone and have fun entertaining family and friends in your backyard. We offer a free no obligation quote. Contact us today and we will be happy to provide you with all of the options available to make your life comlete.